In our busy lives the most precious thing we have is our time, which is why this year I’ve decided to #givepresence instead of presents to everyone I know – young and old. Choosing an experience for my best friend was easy – something we both love to do is eat good food. Taking her out for dinner would have been way too easy and predictable so instead I took her to a place where you get to learn, cook and then eat your own tasty creations. I chose Social Cooking as they were located not too far away and offered a range of different styles of cooking. Plus they do vouchers which makes it an easy – give the gift then sort out which class to go to later. 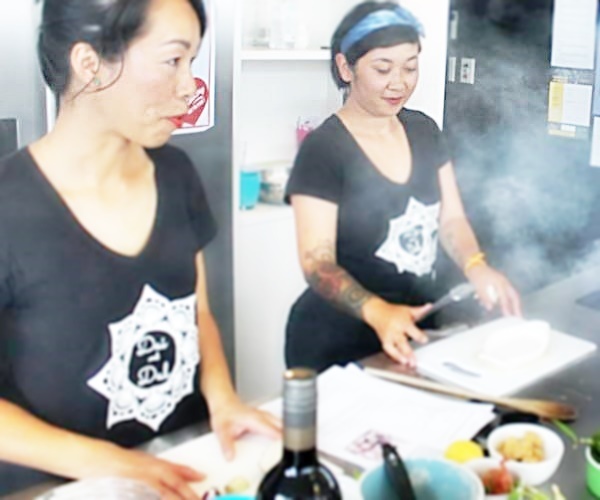 We booked into the Celebrity Chef series to learn to cook MasterChef Dai and Dal’s famous Pork Larb – one of the few dishes to ever get 10 out of 10 from the judges. Just a word of warning – the vouchers you can buy on the site aren’t valid for some shows, so make sure you check this out before purchasing. The place was easy to find and despite being inner city, there was plenty of parking nearby. We were greeted with a glass of wine and joined the other students at a big long communal table. Once seated some bags of bagel crisps were plonked on the table in front of us. Sponsors product I guess, but presentation goes a long way and I think they would have tasted much better with a dip or two. After a brief introduction from Dai and Dal (who are so sweet and delightful) we headed over to the main kitchen to watch them create their famous dish. It was surprisingly simple, and throughout the demonstration they shared tips, thoughts and ideas on their style of cooking – along with the odd plug for the products they’ll be selling on their website when they find the time (those are two busy ladies!). Their Pork Larb was the best I’d ever tasted – and one look from my cooking partner showed she doubted ours would turn out anywhere near as good. After the demonstration we were directed to our cooking stations: ovens pre-heated and all ingredients laid out and ready to be chopped. If only cooking was like this in my house every night! 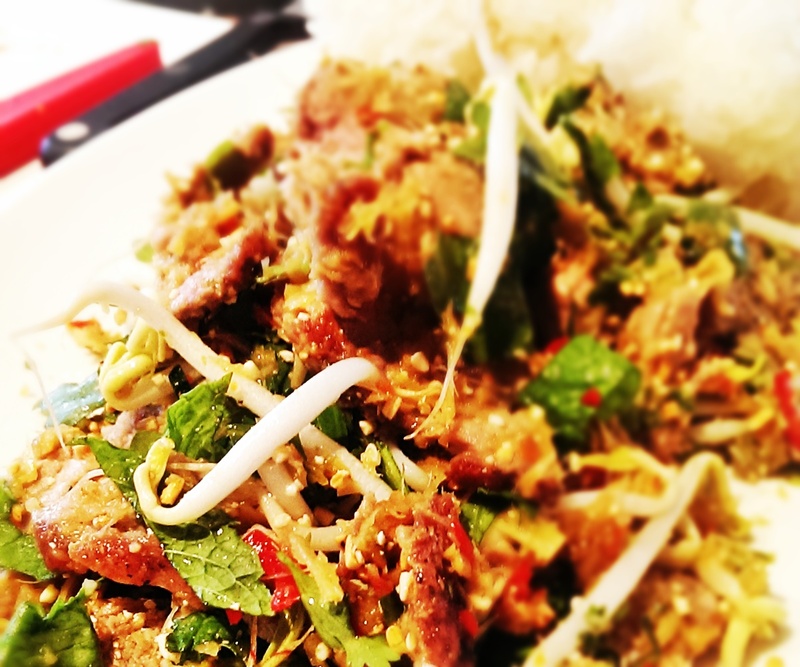 We followed the recipe and before long had our very own plate of Pork Larb ready to serve. And yes, the look from my cooking partner confirmed it was pretty near perfect. Every bit as good as the real thing. Armed with the most fabulous dish I think I’ve ever created, we headed for the communal table to share our success over a glass of wine, while the Social Cooking team whipped all the dishes away. All in all an enjoyable evening, and we left with a treasured copy of Dai and Dals’ Pork Larb recipe which I’m sure I’ll be game enough to try in my own home. Check the calendar to see what they’ve got coming up, but if you buy a voucher make sure it is valid for the classes you think you might want to do. It’s a fun, informal evening so don’t go too dressed up. You’ll have an apron to wear, but at the end of the day you’re in a working kitchen so leave the stilletos and silk dresses at home. Grab a brochure and slip it to your boss as they do team building and corporate events which look like a lot of fun. Everything is provided so all you need to take is yourself – and a friend. You work in teams of two so going on your own wouldn’t be much fun or very social. Comfortable, sensible clothes and shoes. An empty tummy – the food you will cook will be amazing. This sounds like such a perfect activity. And your meal turned out amazing, looks really tasty. It was alot of fun and very tasty. I chose one local to us, but there are places that offer these kinds of social activities all over the place. Crie conteúdo original e de alta qualidade.